"It's going to be magical. You'd love it!" I reminded myself over and over as I sleepwalked to the bathroom. It was four in the morning and I just had three hours of sleep. 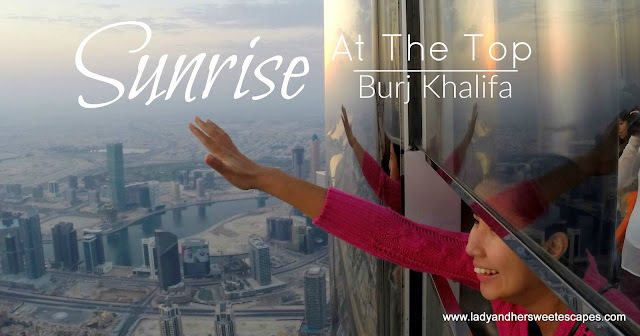 With my half awake half asleep blurry vision, I saw my family almost ready to witness the sunrise at the 124th floor of the tallest building in the world. Sunrise! Yes, out of all the possible viewing times, this sleepyhead decided to purchase sunrise tickets... all for the love of family and the golden hour. It's quite a sacrifice for a nocturnal person to get up in a wee hour. I wouldn't mind if I'm on vacation, especially when I'm travelling. But sleep, eight full hours of it, matters when my body is in its full working mode. We arrived at The Dubai Mall at half past five in the morning. It was my first time to see the huge, always crowded, shopping mall dark and almost deserted. We walked to the lower ground level, to the At The Top reception, where every journey to the 124th floor of Burj Khalifa starts. Surprisingly, we were not the only group who dared to come on an ungodly hour. There were a few people ahead of us; photographers with high end cameras, a family with little kids, people who look like seasoned travelers, while most are probably expats who want experience something new. Since we already claimed our 6 AM sunriser tickets at the online ticket collection machine a day before our scheduled visit, we headed straight to At The Top entrance lobby. We arrived a few minutes ahead of our schedule, hence we had an ample time to check the interactive screen where facts and figures of Burj Khalifa are displayed; something I failed to do during my first visit way back 2010 due to a long queue. After the main lobby and the security check counter, our journey to the observation deck began. 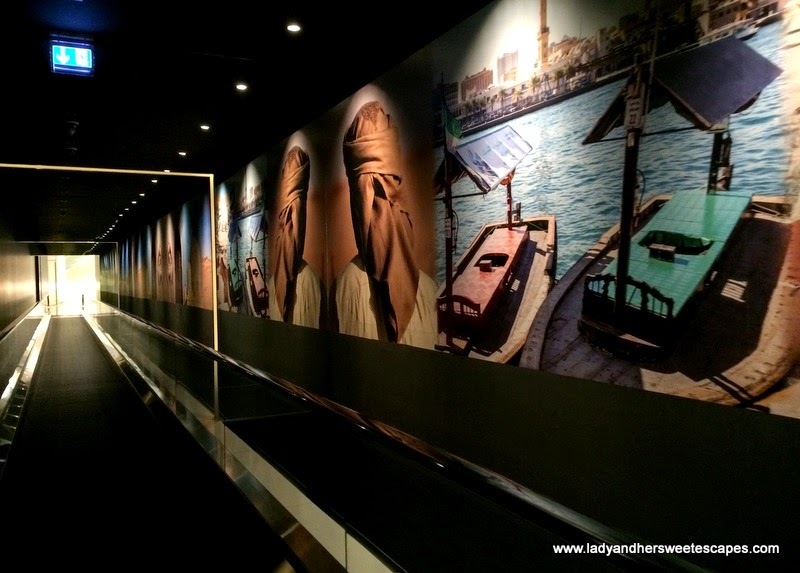 It started in a travelator where we had a glimpse of the astonishing transformation of Dubai. It was followed by a series of introduction to the iconic tower; on why it was built and how it was made. After several stops in multi-media exhibits, we continued our journey on board the infamous high-speed elevator (the one I am most afraid to be stuck in). It's currently the tallest and the third fastest in the world! My ears popped, yet the uncomfortable sensation did not last long as we reached our destination in merely a minute. My husband couldn't stop clicking. It's awesome way up there! As the horizon turned golden, I gave myself a pat on the back for being brave enough to book the 6am viewing time, for waking up to the unusual alarm and for not missing this out. Magical is an understatement! Seeing the earth fill up with light 452m above the ground is surreal, and witnessing it with the family makes it more extraordinary. A brand new day in Dubai starts with this gorgeous sunrise. I was stunned! It's not called the "magic hour" for nothing! The advantage of booking the sunrise ticket is having the opportunity to see Dubai in three different phases; under the night sky, with sun over the horizon and in broad daylight. From the observation deck, Dubai looks like the virtual megacity I built in a simulation game years ago. Hands up if you wasted your teenage days playing SimCity! :) Well, thinking about SimCity was just my way of coping up with my fear of heights. At The Top is not literally at the top of Burj Khalifa. Look how far we are from the top most floor. And look how high the deck is above the ground! Interactive screens provide a close up of the structures in the city along with some information. You can even see how Dubai looks like during the old times when you click the "Historic" option. At The Top offers exceptional 360 degree panorama of Dubai from the desert to the coast! 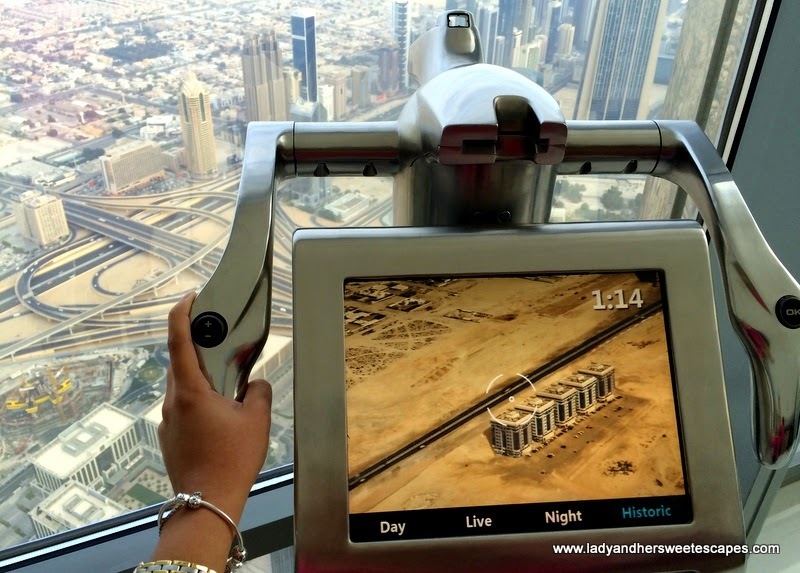 The indoor observation deck has a view of the iconic man-made islands; The World and The Palm Jumeirah. We completed our sky high experience with a quick stop at the gift shop. Then, off we zoomed to the ground level via the high-speed elevator. The next time somebody asks me about At The Top, I'd say "be there at sunrise" in a split second! I wouldn't deny that with only three hours of sleep I did feel like a zombie afterwards. But you know what? Beneath the sluggish body was a happy soul. 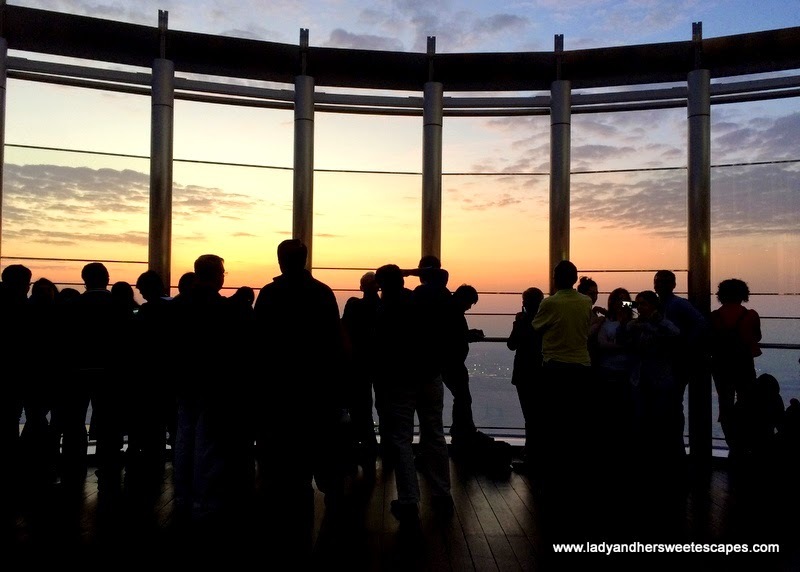 *Sunrise viewing is only available every Friday and Saturday! *Advance online booking is necessary. 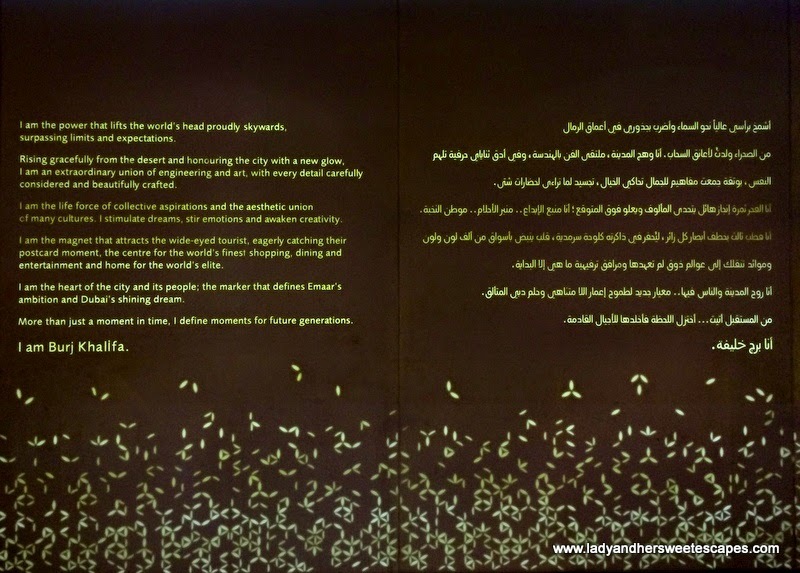 *For more information, please visit Burj Khalifa official website. Beautiful sunrise. I'm just not sure I can handle the height. Haha. Hope you enjoyed! Hi, how can I get the same tickets? Their website doesn't have it n I will be there next week.